Tim and Valerie Miller of Paynesville recently bought Ace Hardware and Home Center on Washburne Avenue in downtown Paynesville from Brad and Harriette Connor. The Millers have renamed the business Lake Country Paint and Hardware. Along with a new name, the Millers plan to make a few other changes to the business. The store will no longer be affiliated with Ace Hardware, instead it will be a part of the Hardware Hank family. Valerie and Tim Miller recently bought Ace Hardware and Home Center in Paynesville and renamed it Lake Country Paint and Hardware. Lake Country Paint and Hardware will also have a slightly different focus, according to Tim. 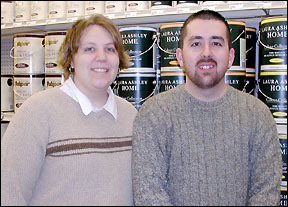 The Millers hope to emphasize paint sales in their new business with the addition of Valspar and Laura Ashley paints, as well as a full line of faux finishing supplies. Eventually, Valerie would like to add faux finishing demonstrations or workshops. Another change will involve the cellular phones that the old store carried. Instead of Cellular 2000 phones and service, Lake Country Paint and Hardware will sell Sprint phones and service. Tim, who has a degree from Ridgewater College in retail sales management, plans to be behind the counter and working directly with customers. He grew up in the hardware business and has always dreamed of owning his own hardware store, he said. She's excited about learning more about using paint to create faux finishes, she added. When Tim and Valerie aren't busy in their new store, they like spending time with their 18-month-old son Nathan, camping, riding motorcycles, and walking.